The pretzel-like poses are done not only to strengthen and tone the body, but primarily to help relax the body and loosen the mind so that long periods of meditation could be performed. This way, it becomes easier for the practitioner to sit in stillness for long periods of time. At the same time, it takes a lot of focus and concentration to be able to properly do the poses during yoga practice. Yoga is a Sanskrit word that means yoke. It is from the root word yuj that means “to unite” or “to join.” The practice of yoga necessitates the need for self discipline. There is a need “to yoke” or to attach oneself with determination and discipline to the task at hand that is needed to attain moksha. The words used in yoga are ancient Sanskrit words. Sanskrit is a language that dates back to more than 7,000 years ago and is said to be a descendant of the Proto Indo-European (PIE) language, believed to be the common mother language of other languages including Greek, Latin, all the romance languages, Germanic, Baltic and Celtic languages and English. Various elements are united in the practice of yoga. The mind and body are united in practice. Each pose is done in union with the breath, as doing each pose becomes easier when it is done with the proper breathing. The aim of the practice is to unite the human soul with the supreme spirit or the Divine spirit. Yoga aims to create a union between thoughts and the source of all thought, between the teacher and the student, between the energy of the practitioner and others in the room. It is an effort to discover the Divine and to remain in union with it in daily life. Yoga helps the practitioner stop worrying or thinking about the past or future and endless worries and helps keep the focus on the present moment and to be in a place of eternal presence. Yoga is taught by a guru or teacher. The word guru stems from two Sanskrit syllables, which means “darkness” and “light”. After all, the task of the guru is to assist a practitioner from darkness into the light. 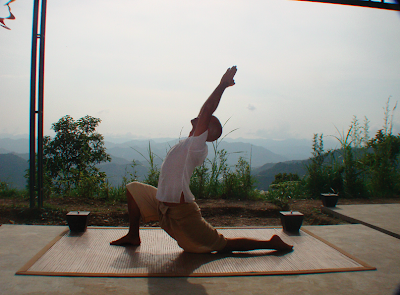 A practitioner or one who opts to follow the path of yoga is called a yogi. This transfer of grace from the guru to the yogi is called mantravirya. One of the most important aspects of yoga is breathing or regulating the prana. Prana refers to the breath of life. It is very important to be mindful of breathing while doing various poses. Mantras are recited during the practice to help achieve a state of deep relaxation and meditation. The ancients believe that the sounds that the mantras create resonate with the language of cosmic consciousness. For the practitioner, reciting the mantras and Sanskrit words helps reconnect the person with the divine consciousness. The sound of infinity or the first mantra is Om. Many practitioners begin with the mantra Om Namah Shivaya, which translates beautifully to “I honor the divine in myself and in others”. Yoga isn’t just about the pretzel like poses that people are familiar with. It truly is a way of life that affects all aspects of the practitioner’s being. According to the textbook Yoga Sutras written in 200 BC, there are eight limbs that form the complete yoga system. Yama refers to the five abstentions or the positive ethical guidelines that a person must practice. These include non-violence, celibacy, non-stealing, truthfulness and non-attachment. Niyama refers to the five positive behaviors of a true practitioner, such as cleanliness, contentment, devotion to god and self-discipline. Asana refers to the powerful postures done during the yoga practice that results in a strong, flexible and energetic yet relaxed body. It literally translates to “seat”. Pranayama or “suspending breath” is the breathing exercise central to the practice of yoga. Proper breathing during yoga helps not only create good health and inner calm, but also helps in doing the various poses. Prathahara or “abstraction” is the concept of detachment. This helps the practitioner transcend the various trials in life and remain constant. Dharana is the practice of focused concentration. Dhyana is meditation. By stilling the mind, the practitioner is able to open one’s heart to receive healing, love and understanding. Samadhi, means “liberation”, and is a state of constant peace, bliss and happiness, wherein the practitioner experiences the presence of God at all times. Regardless of ethnicity, religious belief, age or political affiliation, this is a concept that people all around the world want to achieve. A session of yoga ends with a very positive affirmation in saying Namaste, which means, “I honor the light in you and in all”. Yoga today is practiced by countless people from around the world. No longer is the practice limited to Buddhist monks, Indian devotees or gurus. Today, there are a number of people all over the world that have chosen to make yoga a part of their lives. Some of the famous celebrities who regularly practice are Madonna, Jennifer Aniston, Carlos Santana, Russell Simmons, Adam Levine, Jon Bon Jovi and Sting. Even Lady Gaga and Chelsea Clinton practice yoga! Once a person understands just how meaningful yoga can be, the yoga practice can take on a whole new level. While others simply choose to practice yoga for the health benefits, many others all over the world find that this ancient Hindu practice can bring meaning, peace and harmony to a person’s life.